The WeatherTech FloorLiner accurately and completely lines the interior carpet giving "absolute interior protection"! The WeatherTech FloorLiner lines the interior carpet up the front, back and even up the sides of the 2003 Honda Odyssey’s footwell. Digital laser measurements of interior surfaces offer a consistently perfect fit! Have purchased these mats for my 2012; 2013 Odysseys and a 2016 HRV Honda. My son's 2015 F150 and just purchased them for a new F350 Crew cab. I really love how they protect the carpet and are simple to clean up. Thanks WeatherTech for a great product. I just ordered a new Sunbrella car cover for my 1940 Olds business Coupe and looking forward to a great cover. I love our Weather Tech floor liners -- custom fit, quality material, durable. I will never go back to regular mats from a store. Never again. In fact, I just got another vehicle & immediately ordered another set & the online process was so simple. Grandma has purchased this product for 15 years! 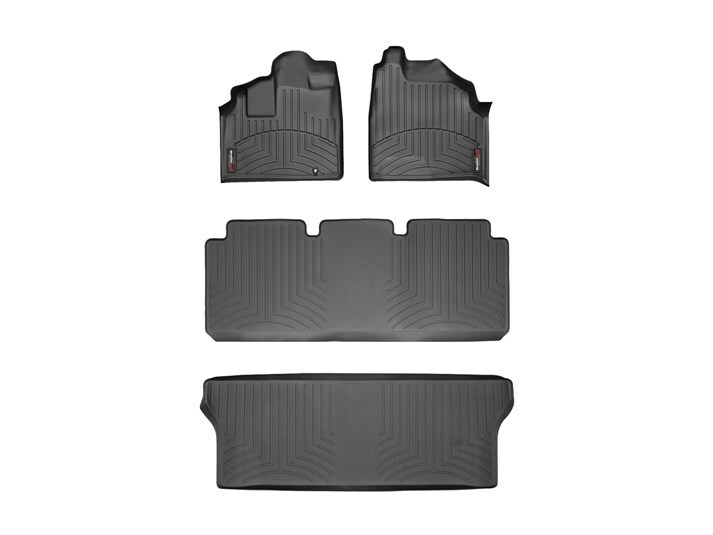 I have purchased the floor liner set for my 2002 Odyssey, 2008 Odyssey and now my 2015 Odyssey. It is a high quality product and made in the USA. Just installed the Weathertech liners in our 2018 Honda Odyssey. We purchased liners for all three rows plus the trunk. The Cocoa color is a perfect match for Honda's "Mocha" interior on our silver EX model. I love the precise fit and coverage. The walls will keep debris from getting onto the car floor. It's not super heavy either but not flimsy cheap. Only complaint is that the 2nd row liner partially blocks the floor vent. They may want to look into this design. Overall, great product and worth the money as a long term investment. I have had the weather tech floor liners on 3 of my vehicles and they never disappoint. Perfect fit and durable, these are the last floor mats you will need to purchase! They are great for trapping sand and salt in harsh Iowa winters and any other spill that comes your way. When we purchased our 2007 Honda Odyssey this year, it was in imaculate condition and I wanted to keep it that way. I looked at alot of different styles and brands of all-weather floor mats, but WeatherTech was the only one I found that would cover every part of the van. We also purchased the cargo liner, because we have 2 large dogs. Everything fits awesome and our carpets are still looking brand new because I purchased from WeatherTech! With two kids in travel soccer, our previous van's interior took a beating. The van was 11 years old, but the interior looked 20 years old. With the purchase of a new van this year, I vowed to do everything I could to keep the interior looking new all the time - Weathertech has made that task much easier. The digital fit floor mats in all three rows are awesome and collect a weekends worth of dirt & grass with ease. Great product, great company! A NEW VAN NEEDS NEW MATS. I HAUL EVERYTHING FROM 4 BICYCLES TO 3 SETS OF GOLF CLUBS...THE DIRT IS CONTAINED IN THE CARGO AREA..UP FRONT A WHISK BROOM EASILY REMOVES THE DIRT . While taking my Australian Shepherds herding my brand new digital fit floor liners paid for themselves in one morning. On hot days I often fill two or three half gallon plastic water bottles about 1/3 full with water and freeze them. The next morning I top them off with water and we have cold water for the dogs all day in the heat. I put one bottle in the cooler and placed the other one behind the driver's seat on the floor. What I didn't realize was that the bottle behind the seat had developed a crack.and as the ice melted it leaked all the half gallon of water. When I got back to the van hours after leaving it I found the mess but my floor liner had held every drop of the water! I simply tossed a spare towel into the mat to soak up the water and then tossed the towel onto the open van gate to dry. There wasn't one drop of water on the floor of my van. That much water is a huge pain to clean up and could have ruined the flooring in my brand new vehicle. But YEAH floor liners! To make having floor liners even better, we herd or do agility in the rain or shine, dry or mud---my floor liners just let me brush out the dirt, grass or mud. They keep the van beautiful and clean so that I can enjoy working with my dogs, not worrying about the van.